Did you know that there are only five communist nations remaining in the world? (At one time there were more than twenty-five.) They are China, Vietnam, Laos, North Korea and Cuba. I’m happy to say that Heaven’s Family is working in all five. China and Vietnam, although still politically communist, have embraced capitalistic economic policies and are enjoying economic booms. The proud leaders of Cuba and North Korea, however, continue to cling to a dying system that is sure to collapse. It is only a matter of time. Imagine gathering a group of ten men in a tomato field and telling them that you’ll pay them $5 for every bushel of tomatoes they pick. At the end of the day, the top picker may have picked 30 bushels, earning $150, and the slowest picker may have picked 20 bushels, earning $100. Of course, when worker productivity decreases, company profits suffer. Soon, workers’ wages will have to be cut. And it is all downhill from there. We should not be surprised that communism is in its death throes around the world. Rather, we should be surprised it has survived as long as it has. Amazingly, while much of the world has been waking up to the fact that poverty can never be eradicated by robbing people of their incentive to work, the church keeps sleeping. We continue to shovel money at the poor in the name of compassion, and ultimately hurt the very people we’re trying to help, and everyone else as well. We’ve forgotten that the Bible not only commands us to care for the poor, but it also commands us not to assist those who won’t work: “If anyone will not work, neither let him eat” (2Th. 3:10). Sadly, we’ve often robbed the poor people of all their self-initiative through our handouts. Think about this: Capitalism—even when practiced with far-from-perfect adherence to the Golden Rule—has lifted multiplied millions more from poverty than philanthropy or charity ever has or will. Or let me say it this way: The people who haven’t been trying to lift the poor, but have simply been trying to make a profit, have been exponentially more successful at lifting the poor than those of us who have been trying to lift the poor (and not make a profit)! Clearly, the best way to lift the poor is to give them opportunities to apply themselves to work—to acquire knowledge, skills, tools, and money. And that is one of our overriding focuses at Heaven’s Family. Although we will always be ready to freely give to our spiritual family members around the world who are temporarily facing desperate circumstances, we will strive to help them become self-sufficient as soon as possible. We are unashamed “Golden-Rule Capitalists”! — Training poor Christian farmers how to increase their harvests, thanks to gifts to our Farming God’s Way Fund. — Providing educational opportunities for very poor children, thanks to Orphan’s Tear child sponsors and gifts to our Education Fund. — Offering Opportunity Loans to (1) orphanage directors through our Orphan’s Tear Self-Sufficency Fund, (2) disabled believers who can work through our Christians with Disabilities Fund, (3) widows who can work through our Christian Widows Fund, (4) subsistence farmers through our Micro-Loan and Village Development Funds, (5) national missionaries through our National Missionaries Fund, (6) recovering victims of natural disasters through our Disaster Relief Fund, and (7) even North Korean Christians who are taking advantage of their repressive nation’s illegal underground economy through our North Korean Christians Fund. As you are reading this, I’m currently visiting some of our micro bankers in communist Cuba and their successful entreprenurial borrowers, thanks to gifts to our Cuban Christians Fund. 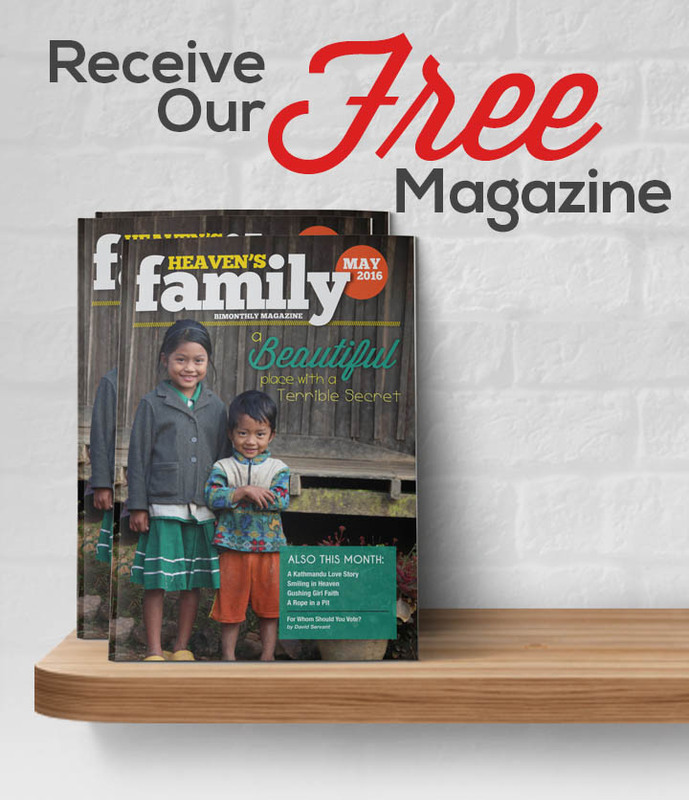 This month, we’ve decided to forgo our e-monthly magazine in lieu of this special letter. But I’ve included at the bottom of this email a list of the Focused Funds that I’ve mentioned in my letter if you would like to sow into any of them. All of them are a means to lay up more treasure in heaven (an incentive from God!). And please don’t forget about our General Fund, the backbone of Heaven’s Family, and my Teaching Ministry Fund, which enables us to minister God’s Word to thousands of people around the world every day. I’m so glad you are a part of the family on the narrow path to heaven! One day we’ll all be there, together! P.S. If you want to contribute to any of the above-mentioned funds, please click on the appropriate fund below. Thanks!